Rats! Did I See What I Saw? 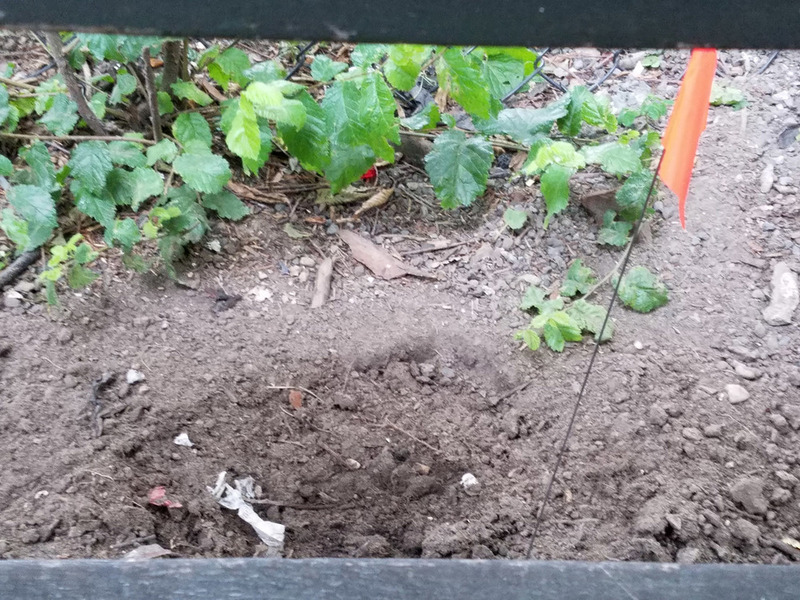 I published an entry very early on July 2 taking the New York City Parks Department to task for allowing rodenticide use in Tompkins Square Park. Rat poison could be lethal to the five red-tailed hawks that now hunt in the park. Rat poison can kill the rats, but it also can kill any animals that eat the poison or eat the rats that have ingested the poison. I spoke later on Saturday, July 2, with Terese Flores, the park manager of Tompkins Square Park. I told her what I had seen (described below), and why I feared the use of rat poison, since the buckets had had "Rat Pellets" printed on them. She told me that what I had seen was city Department of Health workers pouring dry ice pellets into the bucket, which would then be forced into the rat holes. Ms. Flores informed me in an e-mail on July 4 (thank you for working on the holiday! ), "The dry ice kills the rats in their holes so the hawks are not exposed to any poison." She also noted that she had provided the Health Department staff with buckets that do not have the label, so there should be no more confusion. So I am happy to report that there are quite a few on "rat patrol" in Tompkins Square Park: the five hawks, the Department of Health, and a very caring and concerned park manager. My deepest gratitude! THURSDAY, JULY 1. TOMPKINS SQUARE PARK IN THE EAST VILLAGE IN MANHATTAN. When I first arrived in the park to look for the three red-tailed hawk babies and their parents, Dora and Christo, I walked by the garden area across from the bathrooms on the north side. There I saw red flags placed near rat holes. After watching the hawks for a while, I went to get pizza on Avenue A (yes, there is still really good dollar pizza left in Manhattan). When I returned through the southwest corner of the park, I saw three men at the bench pictured below, one in front and two behind the fence. All three were wearing black shirts with a logo on them — while I couldn't read the logo, I did note that it was not the logo of the New York City Parks Department (the leaf logo). One of the workers was scooping a small container of pellets out of a large cooler that was emitting vapor from dry ice and transferring them into a bucket that was also on the bench. The bucket had "Rat Pellets" printed on the side. I went back to the east side of the park to watch the hawks, but I sent a message to a dedicated park ranger I know advising him that I had seen what looked like poison being put in the park. He asked me to send him photos. When I returned to the site a little later (I was delayed by very active and photogenic hawks), the workers were no longer there. I walked around, but couldn't find them again. I took the photo below to show what I could still see. The southwest area of Tompkins Square Park, July 1, 2016. As I have noted above, I have since found out that the pellets were dry ice pellets. But why did I get so upset when I saw the workers putting out what I thought was poison? Because those of us who love the hawks know how deadly the anticoagulant poison can be if the birds eat the rats that eat the poison. These hawks are so very magnificent, and I thrill to see them when I go in the parks, as do so many others I talk to as we look up on the buildings or in the trees or in the sky. I took the photo below the same day. To see the birds dying of rat poison can break your heart. To imagine parks without them is unthinkable. Tompkins Square Park fledgling, July 1, 2016. I understand the need in a city like New York to get rid of rats. I hate rats, both in the park and in my apartment building. I also hate mice (see my post Why Every Rat Is Guido, which I first published in May 2012). Mayor Bill de Blasio has declared war on New York City's rats, and I see notices from the Department of Health on the railings of many buildings on whole blocks of the Upper West Side advising that rat poison is being used in the neighborhood. But the reality is that the rat poison is of limited effect in terms of eradication. The Times article linked above on Mayor de Blasio's crusade against the rats notes: "There have been 109 mayors of New York and, it seems, nearly as many mayoral plans to snuff out the scourge. Their collective record is approximately 0-108." The best solution to rat infestation, according to the University of California Integrated Pest Management Program, involves "three elements: sanitation measures; building construction and rodent proofing; and, if necessary, population control." It notes the possible need for rodenticides outdoors, but also notes: "All rodent baits are toxic to dogs and cats, so be cautious when using these products." I didn't see a discussion of dry ice on this Web site, and I hope it is a possible alternative. Pale Male's offspring killed by rat poisoning in 2015. "The use of any rodenticides pose a poisoning risk to children, pets and wildlife," according to the Safe Rodent Control Resource Center. And included in the wildlife are the red-tailed hawks and other raptors that visit New York City and our public parks. Last year, at least one of Pale Male's offspring died of rat poisoning, a loss that devastated those of us who had chased the babies. And in April, as noted above, a red-tailed hawk died terribly of rat poisoning in Chinatown. Raptors Are The Solution (RATS) is one of the most powerful voices out there for the hawks and other birds of prey. The organization is fighting to "see all anticoagulant and other poisonous rodenticides taken off the market and no longer used by pest control companies due to their dangers to children, pets, and wildlife." But its efforts have been thwarted in New York State. From the Cornell Lab of Ornithology Web site: "Last year, the Cornell Lab of Ornithology joined with NYC Audubon, the American Bird Conservancy, the Center for Biological Diversity, Earthjustice, and Raptors Are The Solution to file a petition in the state of New York to ban the use of all second-generation anticoagulant rodenticides. The petition was denied by the New York Department of Environmental Conservation." Raptors Are The Solution offers some alternatives and tips, stressing that the main task to combat rodent infestation is to "start by finding their source of food, shelter, and water and exclude them from it." That means providing rodent-resistant trash cans wherever possible, and building structures that prevent rats from entering. The organization also recommends picking up bird seed waste in the yard (something I will take to heart when I feed the birds — I am guilty of leaving seeds on the ground). Among other recommendations are electronic "rap zappers." The main recommendation, though, is that any extermination should be poison free. It is understandable that the apartment buildings and businesses surrounding our city parks are going to try to use the least expensive means of rodent extermination, and that can mean that a super or a restaurant manager is going to visit the hardware store and purchase rodenticide. Getting them to stop will be an uphill battle, involving education and incentives. While I favor the electronic rat zappers and other rat traps, these traps are highly labor intensive, and the electronic ones can be very expensive. The city and most building owners will resist these alternatives if they can readily get poison. 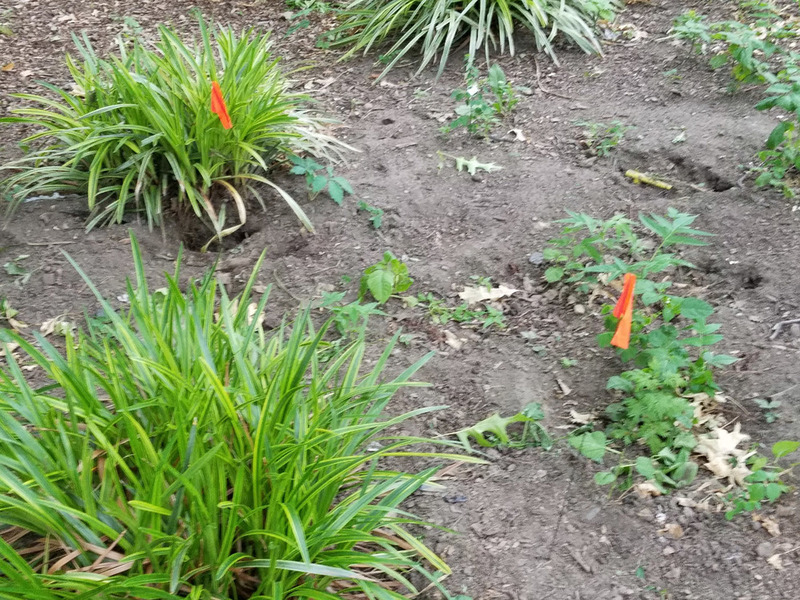 As you can see from the photos I took in Tompkins Square Park on July 1 (below), all of the flags I saw were next to areas that showed absolutely no signs of planting, so I knew what I saw being put out that day were not seeds (one of my Twitter followers asserted that what I had seen were seeds being put out). There were also no signs anywhere describing what pesticides were being used or about to be used, something that is supposed to be posted in the parks. And when I went to check the flags across from the bathrooms I had seen when I first entered the park, I noticed that the rat holes had been filled in, a sign that the pellets had been buried. I wish I had taken photos when I saw the men with the pellets. If I had, I would have written a different blog! Why didn't I? I think my journalistic instincts were overtaken by my self-preservation instincts. I have learned from walking in the parks and talking to other regulars that photographing wrongdoing can result in a very nasty argument, or worse. I hesitate to take pictures of people who might object, perhaps violently, to my documentation efforts. But if I had it to do over again, I would take the pictures so that I would have more proof of what I saw. Yes, I DID see what I saw. But I interpreted it incorrectly, and for that, I apologize and hope this corrects the record. I am sometimes asked what we can do. Using social media to spread the word is worth trying. Writing letters to the mayor is one idea, or to our other representatives. For example, Assemblymember Linda B. Rosenthal recently e-mailed a list of upcoming events to her constituents. One event listed is the West Side Rat Academy, made available by the Department of Health. I imagine rat poison will be a solution that is promoted. We can certainly encourage our representatives and the Department of Health to consider putting more emphasis on alternatives to rat poison as much as possible. I am very pleased that the Department of Health is already trying alternatives, and I hope these are discussed in the Rat Academy. Maybe if more citizens, officials and agencies who value the hawks keep pushing for alternatives to rodenticide, we can have a city that protects our feathered rat patrols, not one that exterminates them. Here are some reference links to sites that discuss the harmful effects of first-generation and second-generation rodenticides on both pets and the wildlife that prey on rats and mice. Some sites offer reasonable alternatives with research backup. Please also check the links I've provided above. Boston Is Trying a New Way to Kill Rats, Boston.com, April 28, 2016. This is one news article from a Google search. There are some others, but seem to include this information. Safe Rodent Control Resource Center. This site is one of the best discussions I've found on the issue of controlling rodents while keeping pets and wildlife from being killed. See, for example, Rodenticides: Background & Hazards. New York City Escalates the War on Rats Once Again, The New York Times, June 24, 2015. StopPestInfo. This site discusses the toxic effects of rodenticides. "There are no pet-safe poisons, as all of poison baits are created to kill rodents. Be very careful: rodenticide poisoning may occur when your pet swallows such bait. Try alternative methods of getting rid of rats (electronic repellers, for example) if you’re worried about pets." From the Raptors Are The Solution Web site, a link to Marin's Countys poison-free rat management plan. Rodenticides Can Harm Wildlife, edhat Santa Barbara, April 18, 2015. Raptors and Rat Poison, All About Birds, The Cornell Lab of Ornithology, July 15, 2015.